We LOVE and NEED volunteers! Click here to learn more. We hire 2 – 4 seasonal farm interns who demonstrate an interest in urban agriculture, food justice and food systems work. You don’t have to want to be a farmer or even have any farm experience. Food touches all parts of our world and we are looking for people who want to take what they learn here into their world and create a more just and healthful food system. Learn more/apply here. Common Ground High School is engaged in our farm on many levels. Green Jobs Corps (GJC) provides year round employment to students in various environmental organizations in New Haven. Each season 3-6 students work here on the farm! They are the backbone that supports the work that gets done to grow over 8,000 lbs of food a year. GJC youth are paid minimum wage, participate in job readiness workshops and develop real-life, transferable skills while experiencing the realities of growing food. 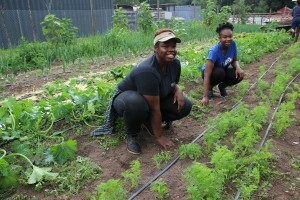 High School Classes – Common Ground uses its urban farm as a learning laboratory, helping students to master academic standards and develop leadership capacity through active, authentic learning opportunities. Students practice conversational Spanish and French as they work in small teams on the farm. In math, projects include calculating the true cost of a Common Ground egg and calculating the pH of soils across our campus. Guidance classes grow and sell perennial herbs for our seedling sale. Environmental Science courses monitor nutrients in our farm soil. The opportunities are always growing. We aspire to engage the high school in all areas of the farm. Pulling weeds to feed our animals, picking blueberries, and harvesting key ingredients for cooking programs are just a few of the ways our community programs participants “work” on the farm. The big lower garden is always available for groups to experience and enjoy based on the program and interest of the group.